AMAZON HAS ENTERED THE ARENA. 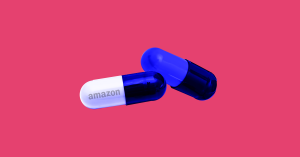 On Thursday, Amazon announced it had bought PillPack, an online pharmacy for about $1 billion, a source briefed on the deal told The New York Times. The news caused waves in the $560 billion prescription drug industry; shares of publicly-owned drug companies like Walgreens, Rite-Aid, and CVS dropped by 9.4 percent, 13 percent, and 9.2 percent, respectively. SMARTER PRESCRIPTIONS. PillPack is pretty unique in the pharmacy industry. First, unlike its competitors, it has no brick-and-mortar stores — the company only delivers medications in the mail. Instead of packaging user medications by the prescription (with a month’s worth of one drug in one bottle and another drug in another bottle, for example), PillPack packages medications by the dose. Say a person has to take three different pills each morning and two each night. A monthly PillPack delivery would include 60 or so tiny packets. Half would contain all three morning medications, and the other half would have the two evening ones. Each packet would include a descriptive label with information on the contained medications. This service could be tremendously useful for people who take multiple medications. Amazon’s takeover could help PillPack scale up (it currently boasts just 1,000 employees). PillPack, meanwhile, is already licensed to deliver medications to all 50 U.S. states, helping Amazon clear the regulatory hurdles that might have complicated its foray into the prescription drug industry. ALEXA, REFILL MY MEDS. This is the latest of several recent moves that show Amazon is dedicated to making inroads in healthcare. In October 2016, CEO Jeff Bezos said he thought Amazon’s virtual assistant Alexa could potentially help healthcare providers. Then, in July 2017, Amazon launched 1492, a secret lab dedicated to healthcare technology. Just last week, Amazon, Berkshire Hathaway, and JPMorgan Chase announced they’d chosen a CEO for their new healthcare venture. The acquisition of PillPack likely puts us one step closer to the day when we can simply ask Alexa to refill our medications.